Recently I went out on assignment for the St. John Sun Times to cover the 37th Annual Rolex International Regatta. What an event, truly a blast to photograph. I spent the day on the water with several other journalists and really enjoyed the camaraderie. The Regatta featured many classes of sailboats from small two person teams on beach catamarans to larger sailboats with a full crew of sailors. 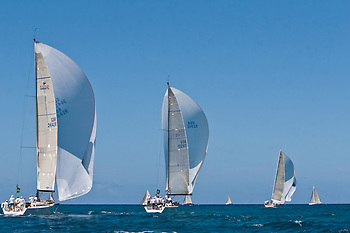 Racing was hosted by the lovely St. Thomas Yacht Club and followed several routes, depending on the class of each craft. Overall the regatta was a great assignment and I look forward to covering future races in the Caribbean. Image of the week, May 24 2010: Pool is open, dive in!